Rhubarb is back in fashion! Helen Simpson, from the Mushroom Shed, tells you all you need to know about growing rhubarb. She has also written articles about growing basil, brassicas, chilli, coriander, cucurbits, garlic, ginger & turmeric, mint, raspberries, strawberries, tomatoes and lesser known herbs. I often hear stories about a rhubarb plant still vigorously producing, even if planted many years ago. Often the ‘crowns’ are taken to a new home when a house is sold, or handed down through family generations. Rhubarb is becoming popular to grow again – so how is it done? Most people grow their rhubarb plant from a ‘crown’, which is the part of the plant under the ground and consists of a rhizome and a bud. However, rhubarb can also be grown from seed. Rhubarb grown from seed will take longer. Growing from a crown gives you a good head start. Crowns can be divided from the main rhubarb plant every five or so years – a plant that has several good sized, distinct growing points indicates divisions may work and they can usually be divided into about three parts. When digging up the crown(s), the crowns may fall apart from each other easily, but generally I’ve had to wrestle with them and split with a spade. The more care taken the better, as damaged crowns can take a while to recover. Crowns are normally divided when the plant is dormant or growing slowly, e.g. late winter. Once separated, crowns can be re-planted about 90cm apart. Plant the crowns with roots downwards – each crown should have one or more white/pink ‘buds’ or growing points. The recommended depth is to have the top of the crown 3cm under the soil. However I’ve found to reduce the chance of rotting, planting the top of the crown slightly above the soil works best. Rhubarb is a perennial and normally stays in position for years. So it is worth making the effort to plant in a good, rich, well-drained soil. Too soggy and your crown may rot. Too few nutrients and you will get thin stalks and a small plant. With generous nutrients and sufficient water, your rhubarb plant should reward you with an abundance of thick, long, juicy stalks. If this is not the case, try feeding with a liquid fertiliser or sprinkle fertiliser near the base of the plant and water well. Note, however, that your rhubarb will go through a winter dormant period where, depending on the variety, it will produce fewer or no stalks. A sunny position is best, however steer away from the hot afternoon sun in summer. Rhubarb will grow in some shade, but will be smaller and thinner. Rhubarb is best planted in the garden where it can spread out. I have seen old crowns as big as basket balls. It can be grown in a pot but make sure it is a very large one. Someone told me to only harvest rhubarb in months containing the letter ‘r’, eg: October, November, February etc. There seems to be some truth in this, as no winter months contain the letter ‘r’ and this is when rhubarb is the most dormant. Generally, however, if your rhubarb is producing well, go ahead and harvest it. Giving the stalks a brisk pull downwards and sideways from the main plant will separate them without damage. Leave at least four stalks in the centre of the plant to keep it viable. Discard the leaves, which are poisonous due to oxalic acid content, as are the roots. During the food shortages of World War 1, rhubarb leaves were promoted as a food source in the UK, leading to the discovery of their poisonous nature. 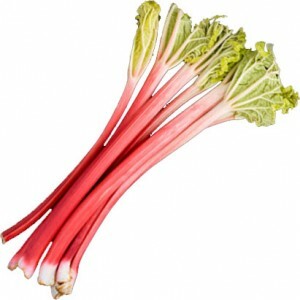 Rhubarb keeps well in the fridge, however if you forget about it, look out, as you can be left with a soggy mess. It can also be cooked down and frozen. Rhubarb must be cooked, and combines well with apple, cinnamon, orange, berries and pears. Sometimes your rhubarb plant may produce a seed head. Unless you want seed, I recommend cutting it off as, otherwise, production of the plant will stop for a while. No, it is not unripe. There are varieties of rhubarb which have mainly green stalks with minimal red colouring – Victoria is probably the greenest. They tend to be extremely productive and still taste good. I mix the vast bulk of the green stalked rhubarb with the lesser bulk of the red varieties, to get both quantity and colour. However, I find the green variety takes longer to cook down. Finally, red rhubarb stalks can look greener in hot weather and redder in winter. Does red chilli planted close by affect rhubarb growth? My new rhubarb is growing well and the stalks are perfect size though still green. The leaves are huge (twice the size of the stems) and they get so heavy. What can I do? I’m not sure why you think you have a problem. Many rhubarb varieties have green stems. Their leaves are always huge. Why am I producing massive leaves 500 X 450mm. And skinny stalks. You could try additional water (assuming your soil is well drained). Also, over winter, try splitting your rhubarb and separating it into several plants – each grown in their own space. My only other suggestion is that it is perhaps not getting sufficient sun – if you do split your plant in winter, you could test out some different locations and see if it makes a difference. Hi. I have planted a Sydney crimson in a pot. The plant has taken off growth-wise. It has been in the pot for 6 months. The stems are very thick and only have a bit of red colour low on the stem. I have been told not to pick the first year and when does the red colour show its true colour. Cheers. Hi Helen. I live in Lilydale and I have bought rhubarb plants from Bunnings, planted them in a 1sqm box and am not having much luck with the plants taking! Any ideas? I’m assuming that you can still see the leaves on your rhubarb plants? The box you have planted them in sounds plenty big enough. If you have recently bought them and they are in good soil, with the weather getting colder your rhubarb plants may take a while to show any growth. In fact around June/July, the plants go into dormancy and may lose their leaves for a few months, before sprouting again in Spring. Regards, Helen. I had the same problem, they just sat there and did nothing. Turns out rhubarb is very demanding on the soil so you need to fertilise them regularly with blood & bone or something similar. I use Charlie Carp diluted and give them a hit once a week. Believe me you can see them grow. Where can I buy some rhubarb crowns for my back garden? I’m based in Clifton Hill in Melbourne. I would love to grow some. I would have thought that most nurseries sell them – my local nursery certainly does. What buzz it was to find your website!!! I was hoping to grow some Rhubarb up at Blackwood but wondering if it is toooooooo cold up there. It should be fine. We got our original crowns from a farm in Ballarat, so assuming similar climate it should grow very well, If you would like some of our ‘Ballarat’ variety, let me know and I can dig you some up. Thanks..Ok I wil give it a go. I just love the Taste recipe for Stewed Rhubarb and Ginger…yum!!! Will come to visit you at the farmers’ market in a couple of weeks but will let you know prior. Would you have a couple of good sized rhubarb roots to sell or give me for my garden? Used to grow rhubarb years ago and would love to again.